In order to learn how to use the forum, you can watch the video, and/or you can read the description below the video. Both cover the same information. TIP: To see the video sharper, in higher resolution, click on the little wheel on the bottom right of the video screen and change the video quality to 480p or 720p. The video will take longer to load, but it will look sharper. Please note: the little wheel only becomes visible AFTER you click the play button. Most of the process is quite easy and pretty much self explanatory. However if you have no experience with forums at all, here is a detailed step by step walk through which will get you set up in just a few minutes. This is what you will see. Click on the “Register” link which is marked on the picture. This is what you will see next. 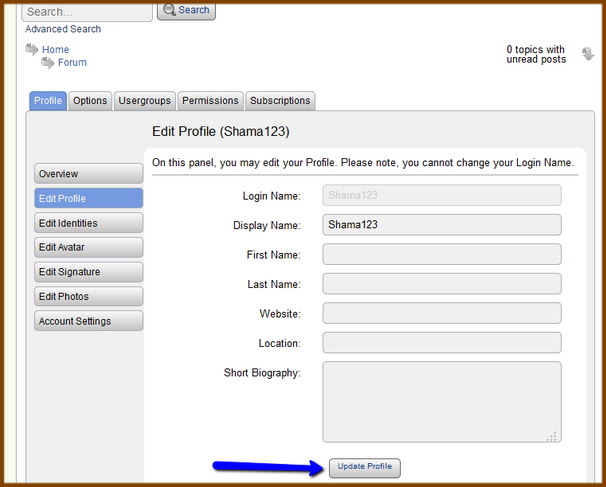 Create a user name which you need to login. It is not publicly visible. Fill in your email and name. Fill in your display name. This is publicly visible. It should be your actual name. Then solve the math question (spam prevention). Next click on “Register”. A password registration link will be emailed to the email address which you filled in on this form. Look for an email from Thai Healing Massage Academy. Open the email and click the link in it. You will be redirected to a page where you can set your password. Replace the suggested password with one of your choice. Make sure to write your user name and password down at this point. 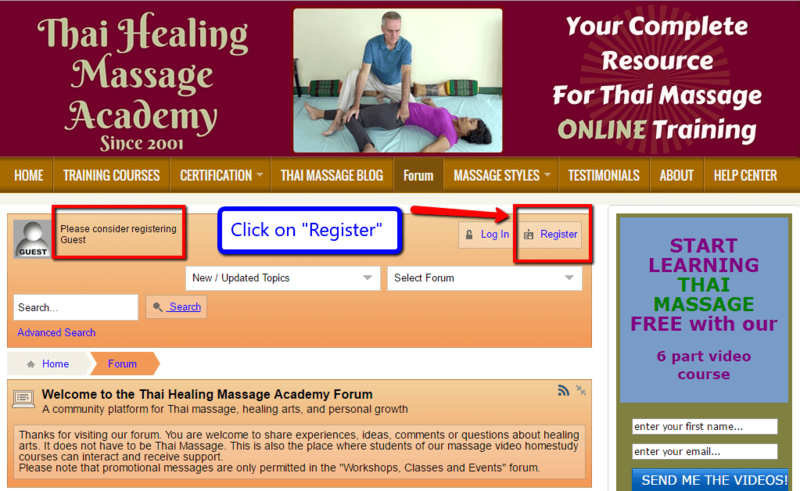 Next go back to this url: http://www.thaihealingmassage.com/forum/. 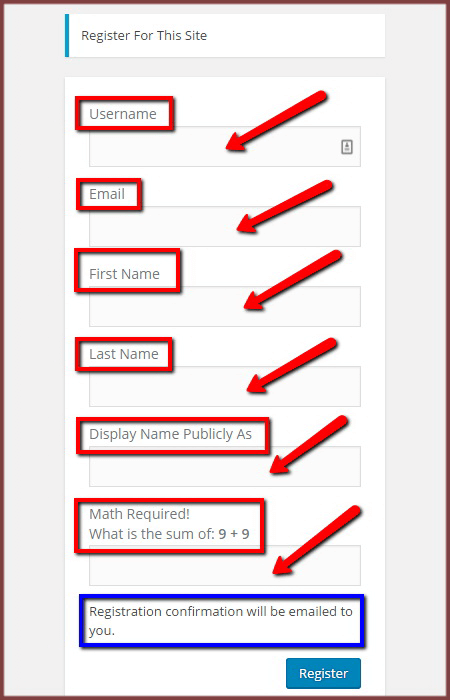 Then click on the “login” link in the top right corner to the right of the “register” link which you had clicked in step 1 (see image 1). Now fill in your user name and password there and log in. You will be redirected to the forum profile section. Click on the “Edit Profile” tab. This is what you will see after you click on the “Edit Profile” tab (image 3). Your login name is already filled in. This name cannot be changed. Now fill in your first and last name, your website, if you have one (use the http://yourwebsite.com format), your location and some biographical info about yourself. Then click on the “Update Profile” button. Now you are registered and logged in, and your profile is complete. You have to be logged in in order to post in the forum. You can easily check if you are really logged in by looking in the top left corner of the screen right below “FORUM”. If you are logged in, it will say: “Logged in as ‘your name’. If you don’t see your login name there, you are not logged in, and the posting will not work. The forum is really a collection of several sub forums. When you login to the forum, you will see a listing of several sub forums. For your first time in the forum, I suggest you choose the “Introductions And Networking” forum to introduce yourself to the community. ==> Now click on this forum (marked as forum 1 in red). This is what you will see after you click on the “Introductions And Networking” forum. Each forum contains a number of topics. These are threads which are started by one person. Each topic can contain many posts. 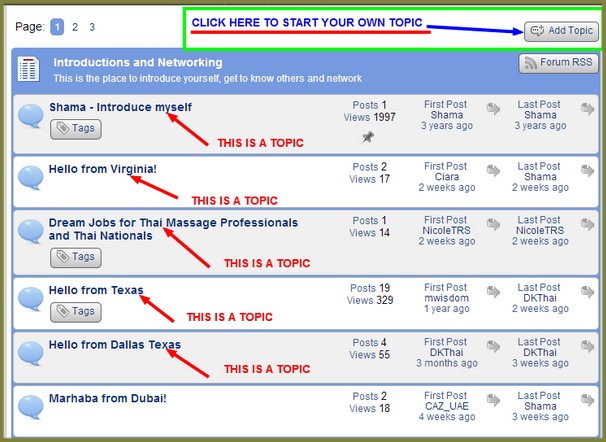 The topic title is the overall description what a collection of posts is all about. 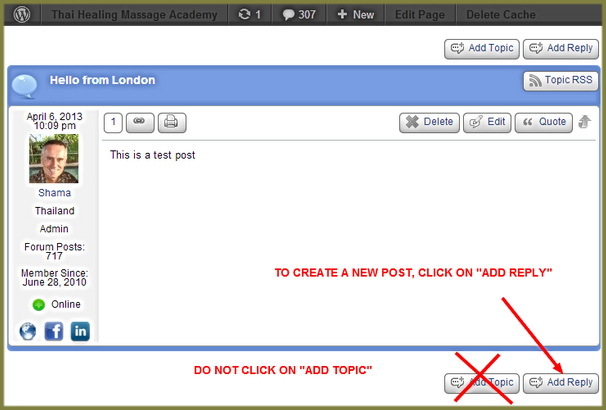 ==> Now click on “Add Topic“. This is what you will see next after you click on “Add Topic“. Fill in the name of your topic, for example “Hello from London“. 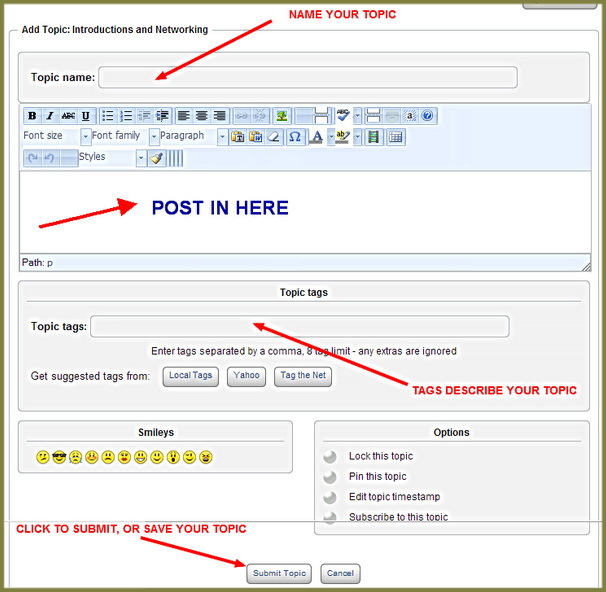 Topic tags help your topic to be found by the search engines. You don’t have to use this feature, but if you do, use words which describe best what your topic is about. 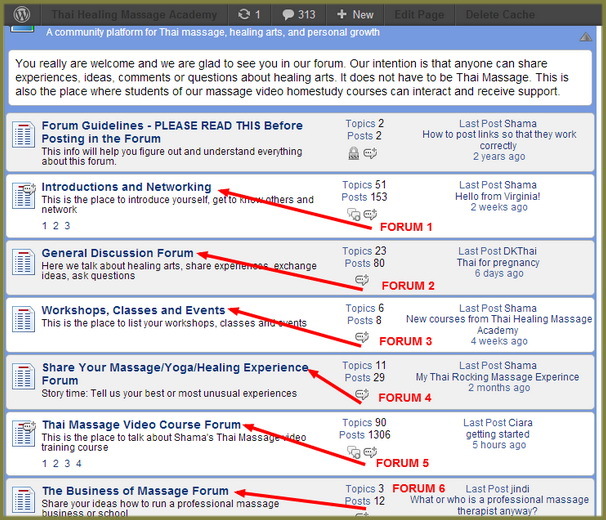 Let’s say if you are going to talk about foot massage, your topic tags should be “foot massage”. Finally click on “Submit Topic” to save what you have entered so far. Now you created a topic, and you made your first post. From now on, all future posts by you or anyone else should go under the same topic. you want to start an entirely new conversation. For example you have one topic where you talk about the Complete Thai Massage course, and then you want to talk about the Foot Massage course. In this case you would start a new topic, even if you are in the same forum. and the posts are the individual comments under the same topic. 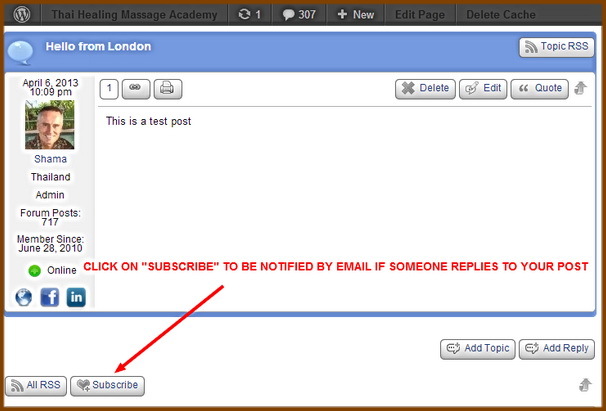 If you want to be notified by email when someone posts something in your topic, in other words someone replies to your post, then you can click on the “Subscribe button”, and you will be notified of each new post in your topic.